For some people, this book offers a way to create a successful business. For others, it talks about a concrete path to finding happiness by creating something that subtly changes many people's lives-- starting with theirs. Shortcuts To Success And Happiness is The Entrepreneur's Guide To Building A Business That Thrives Based On Your Life's purpose. Succeeding in entrepreneurship is not as hard as you might think - neither it's something just a few lucky people are destined to accomplish. Actually, success in business and happiness in life is a science. The principles, laws and steps to success and happiness could be as simple to learn and use as some keyboard shortcuts. And hundreds of entrepreneurs who followed these steps thrived and succeeded in business and life. This Book Is A Must Have For You: *If you are tired of living paycheck to paycheck and want to start a business that you love! *If you want to learn the universal steps that lead to success, retire at 40 (or EARLIER) and get rid of your boss! *If you have an idea for a successful business (maybe even a million dollar one!) and don't know how to make it a reality! Generally, it's a must read if you want to become a THRIVING entrepreneur without spending tons of money on hyped courses or losing your sanity on the way to the top. Set yourself apart from the crowd and learn what it really takes to become successful WITHOUT the guesswork! I loved the book! It is smart and efficient with a touch of humor. It got me thinking about what I want out of life and about my own definition of success and happiness. Play along and do the simple yet powerful exercises suggested in the book and it will do that for you too.The use of clever analogies is what sets this book apart in my opinion, it makes it easy and enjoyable to read. 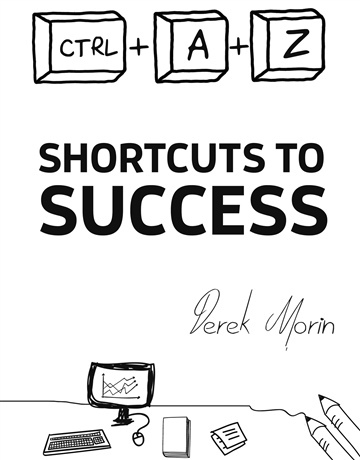 Derek has a way to simplify complex concepts, not to dumb it down, but so that you can actually act on them!This is the kind of book that you can easily read while on vacation and you'll still feel like you've been productive! If you're interested in business, and happiness, this is for you!